John Frederick Gourlay, a third cousin once removed, sent this out to a worldful of Gourlays in October 2009. Robert Fleming Gourlay wasn't exactly one of our ancestors - he's a great great great great grandfather of some of my second cousins - but that's close enough. Those of you with good memories might remember my advice of the activities of our most infamous relative, my 2nd cousin, 5 times removed, Robert Fleming Gourlay. 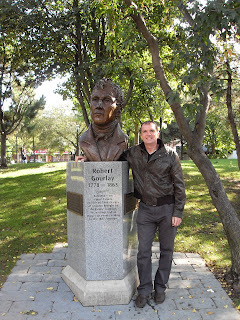 My 3rd cousin, once removed, Grant Gourlay from Dundee has just been visiting Toronto, Canada and took the attached photograph when he visited the memorial to Robert in St. James Park. That's Grant on the right. I thought I'd pass it on for interest. At least I think Robert was a 5th cousin. A newly found cousin thinks that the parents of my 3rd great grandfather John Gourlay [married to Lilias Black] was a David Gourlay and Isabel Howie, not John Gourlay and Agnes Steven as I show in my tree. If anyone has any proof of either, I'd appreciate your advice. I should like to add a later postscript to this - what happened to the sons of Robert Fleming Gourlay? It seems this story continues into the next generation as something rather romantic and picaresque with tales of early Australian settlers, far eastern sea voyages etc. John continues the story.